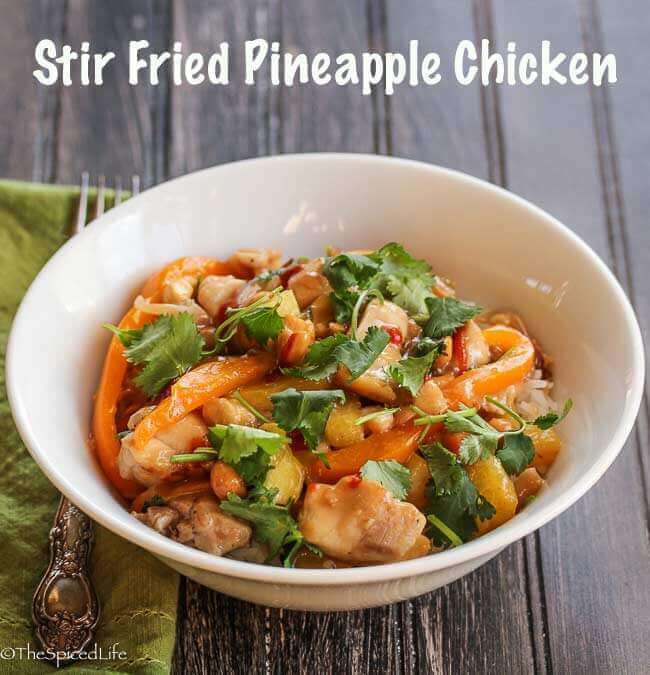 Stir Fried Pineapple Chicken, fast, easy and delicious, is the perfect answer to a weeknight craving for homemade Chinese food. Affiliate links have been used to link to items I am discussing. 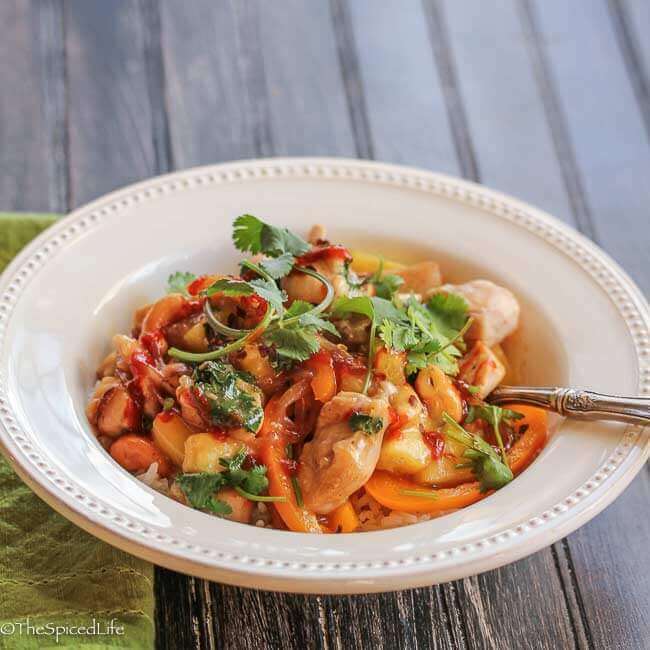 This Stir Fried Pineapple Chicken came about from Sammy requesting Chinese food and me purchasing on a whim Ching-He Huang’s Stir Crazy: 100 Deliciously Healthy Stir-Fry Recipes . 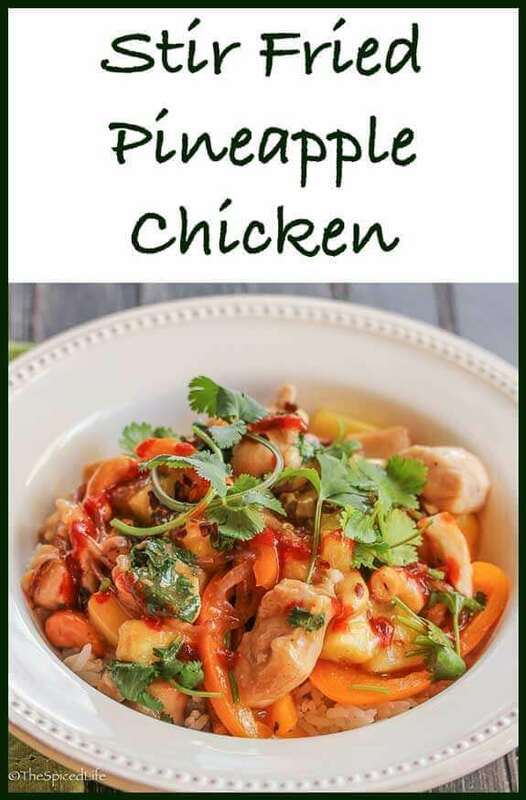 Sammy adores pineapple, so gravitating to the pineapple recipe was an easy call, but actually this cookbook is definitely one of those hidden gems. 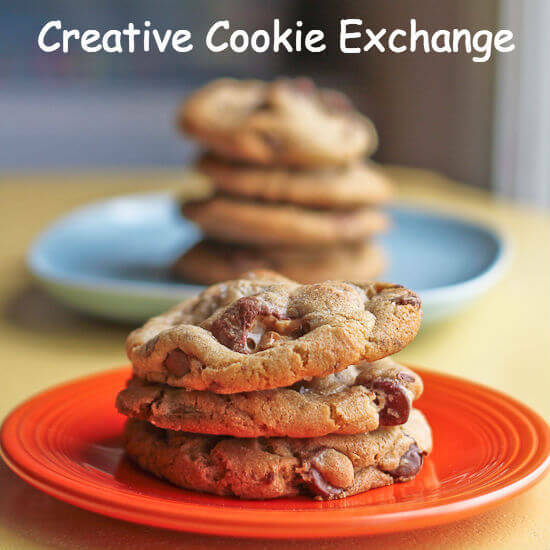 I have bookmarked tons of accessible, easy recipes. 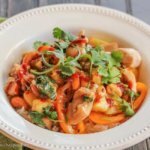 If you like stir fry at all, I highly recommend checking it out. The original recipe called for starting with two dried whole chile peppers, but I skipped those in deference to Alex and just served the dish with extra Huy Fong Sriracha Hot Chili Sauce for those who wanted some heat (John and I for sure). Unless you have an allergy to cashews, I highly recommend not skipping the nuts. They add little bursts of delicious umami crunch; in a pinch peanuts would work as well. My biggest change to the recipe was to add some garlic and ginger. As to the most important question, how did Sammy feel about her Stir Fried Pineapple Chicken? Two enthusiastic thumbs up! 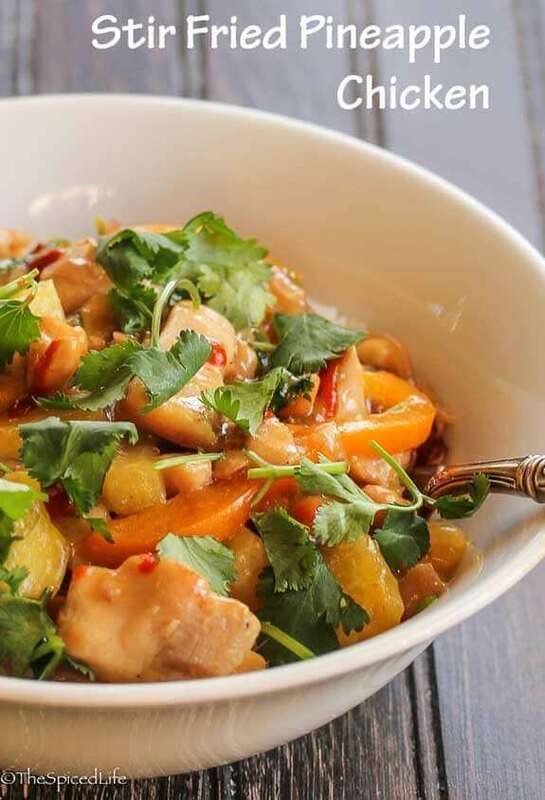 It satisfied her Chinese food craving, and she found it delicious. Happily we all found it delicious, and the small amount of leftovers were quickly devoured. Given how quickly it comes together, I call that a serious win. Green onions are ubiquitous in stir fry--and something I rarely have around because they do not last (on my shelf) like regular onions. So I swapped them out and started with sliced red onions. If you do have green onions, feel free to skip the red onions and add the green onions at the end. 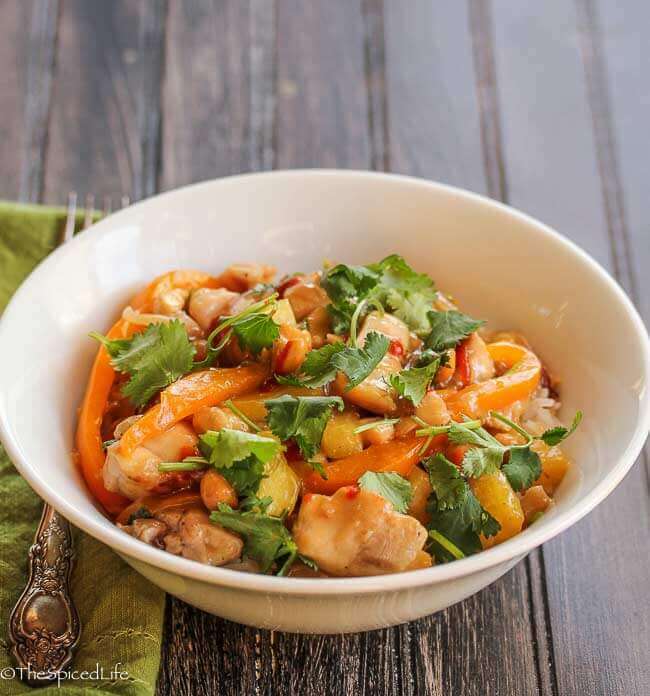 Make sure that all ingredients are prepped and ready to go, including whisking the sauce ingredients together. Whisk the potato starch and a pinch of salt and freshly ground black pepper. Then toss the bite sized chicken pieces in the starch mix and set aside. Obviously woks are best for stir fries, but I find myself reaching for my giant nonstick skillet on my current flat electric cooktop. Whatever pan you use, make sure it is large! Heat it over high heat--with the oil if nonstick. Add the oil after it heats if not nonstick. When the oil is hot, add the onions. Cook, stirring constantly, for 5 minutes. Add the garlic and ginger and cook, stirring, another 2 minutes. Add the chicken and cook, stirring constantly, for 3 minutes. As it turns opaque, add the Shaoxing rice wine and cook another 2-3 minutes until chicken is cooked through. Add the pineapple and sweet bell pepper slices. Cook for about 30 seconds, tossing. Add the sauce and toss immediately. Bring to a boil and let it boil until the sauce has reduced and is thicker, just a few minutes. Add the cashews and let heat through for 20 seconds or so. Then add the cilantro and serve immediately with Jasmine rice. Drizzle with extra Sriracha if you like some heat.